Hollywood doesn't do a very good job with climbing movies. We all remember the catastrophe that was Cliffhanger. And nobody can ever forget the horrific Vertical Limit. But there's something to be said about lost-in-the-mountains style movies. The characters don't need to be climbers with a capitol C. No, instead, they just need to be normal people dealing with a mountain environment. The Mountain Between Us provides that kind of experience, the kind of experience where normal people are lost in a mountainous environment and need to find a way to survive. 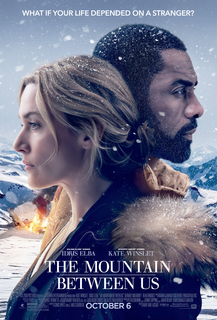 Neurosurgeon Dr. Ben Brass (Idris Elba) and photojournalist Alex Martin (Kate Winslet) become stuck at an Idaho airport as a storm approaches. Both have important appointments back home. Ben has to perform surgery on a child, and Alex is going home to get married. The only way to get home quickly is to charter a plane with Walter (Beau Bridges). During the flight Walter has a stroke and crashes the plane in the mountains where they become stranded. They're either in the Sawtooths or the Colorado Rockies, or maybe somewhere else -- there's a glacier on a peak nearby, something that doesn't exist in either of those ranges -- but, regardless of which range they are in, one thing is certain: they are deep in the mountains in the heart of winter, with no civilization in site. At it's heart, The Mountain Between Us is a romantic survival story about two people who have an intense relationship while trying to survive for weeks on end in the mountains. The pair make many mistakes during their attempt to escape, but they're mistakes that make sense. These really are theoretically normal people with no mountain training, caught deep in a mountain environment. As such, you might be yelling "no" at the film, while also feeling like the decision the person made makes sense. One of the biggest criticisms of the film is that the story seems unlikely. The argument is that people are commonly found quickly after a plane crash. But, even in the 21st century, we know that not to be true. In July of 2015, a teenage girl walked out of the Cascades after surviving a plane crash. Her grandparents did not survive, and nobody was looking for the plane where it went down. Thankfully, this happened during the summer and the girl was only out for a couple of nights by herself. But even for those who don't think such a storyline is realistic, the performances by Kate Winslet and Idris Elba are so perfect, they are so believable, that it's easy to get sucked into the story. These individuals are master actors who have excellent chemistry with one another. I believe every line spoken.